The Le Sigh: Premiere: Old Maybe - "The Shuffle"
Premiere: Old Maybe - "The Shuffle"
Old Maybe's "The Shuffle" is an important dance. My favorite thing about Philly's Old Maybe is their complete and utter realness. The band's members Ricardo, Nina, and Jazz aren't messing around on their upcoming album Oblio, which is a refreshingly outspoken, candid collection of experimental punk songs. The tracks that find their home on Oblio are rough and gritty on the outer layers but that's what make them feel so authentic at the core. Old Maybe's new song "The Shuffle" confronts the idea of reclaiming your space in a place where your voice isn't being heard. From start to finish, it points the middle finger to worn out stereotypes, tears down nasty abusers, and unequivocally speaks its mind. As someone who has recently gotten out of a toxic relationship, this song has been very important to me while finding my identity outside of it and navigating the healing process. Like "The Shuffle" depicts, moving forward after any traumatic experience can be a back-and-forth struggle, quite literally an internal "shuffle" to break away and start anew. 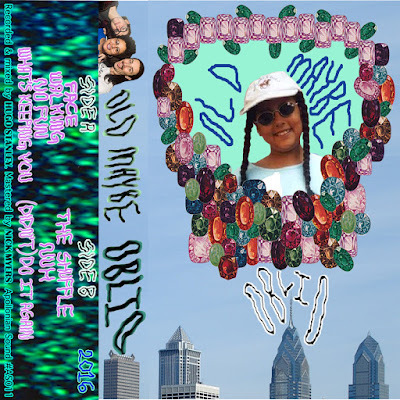 "The Shuffle is a reflection on my experience in the Philadelphia DIY music scene. I wrote it as a response to unfair perceptions and judgements, battling with depression and an eating disorder after falling in love with a narcissist, and struggling for acceptance in spaces led by white, small-bodied, wealthy and privileged "musicians" and "artists." It's about heartbreak and remembering the beautiful parts of abusive relationships. It's about being routinely ignored, tokenized, and used by men. The Shuffle is a dance." Listen to Old Maybe on bandcamp.